Update: This Improv for All workshop will conclude with a short improv set by a team made up of furloughed federal employees: Jon Chesebro, JoJo Franzen, Justus Hammond, Devin Horne, Richie Khanh, and Chris Orvin! Will the shutdown be over by Friday? We can only hope so, but WIT will continue to share a bit of levity with furloughed federal employees through one of our free Improv for All workshops. Our third workshop for furloughed feds is this Friday, Jan. 18 at noon. Join Washington Improv Theater for a high-fun, low-stress classes designed to show you how improvisers create spontaneous, off-the-cuff theater. Our enthusiastic and friendly instructors work to make sure everyone is able to participate in a playful and trusting atmosphere. The workshop will be held on Friday, Jan. 18 at noon at Source (1835 14th St. NW). If you’re not a furloughed worker and want to come, that’s fine—the more the merrier! You don’t need theater experience. You don’t need to be a “funny person.” Just come in ready to have a good time. 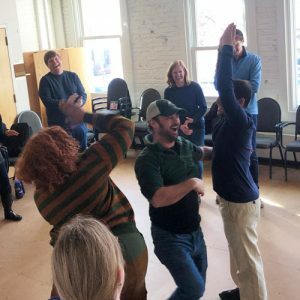 Improv is an amazing way to help people connect with each other and have a reignite their sense of play. And we think Washington needs that pretty seriously. If you can’t make it on Friday, don’t despair. We run these workshops every month at venues across the city. Check out our schedule and sign up!